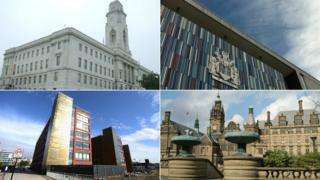 South Yorkshire's £900m devolution deal appears dead in the water after two of the four councils involved voted against the proposal. The leaders of Barnsley and Doncaster councils say the deal "is no longer possible" and that they want to pursue a Yorkshire-wide deal. An in-principle agreement to hand power to South Yorkshire was signed in 2015. Under the proposed deal a directly-elected South Yorkshire mayor would assume control of transport budgets and strategic planning and have access to £30m a year for 30 years. The apparent death knell was sounded at a meeting between the four Labour-run authorities and other members of the Sheffield City Region Combined Authority in Rotherham. Sheffield City Council leader Julie Dore argued that any deal other than the South Yorkshire deal would mean powers for the region would be "diluted". Chris Read, the leader of Rotherham Council, said the four authorities had a "responsibility" to see through the deal signed in 2015. However, Sir Steve Houghton, the leader of Barnsley Council, said the "city region deal is no longer possible" and it was now his aim to convince Communities Secretary Sajid Javid of the benefits of a wider deal. He said the South Yorkshire deal was too small and would not bring the same funding and political impact as a wider deal. Speaking after the meeting, Ros Jones, Mayor of Doncaster, said: "I'm here to get the best deal possible for Doncaster and the widest possible footprint will be better than the four South Yorkshire authorities." Despite the impasse, a mayoral election is scheduled to take place in May 2018 with the government saying it has "no intention to undo the legislation" for. Anyone fancy electing a mayor that will have no power whatsoever? No? What if I told you it'll cost us more than £1m? Still no? That's where we are in South Yorkshire at the moment. Today's meeting was a quick end to the lingering idea that Sheffield, Doncaster, Barnsley and Rotherham might actually agree with each other. We're left with no extra money or power, and quite possibly an elected mayor that will just be another suit in the room. Doncaster and Barnsley say their decision to end a South Yorkshire devolution deal and seek a wider Yorkshire one is not a gamble. But when the government says that it just won't happen, the odds look pretty stacked against them. In August, 17 councils, including Barnsley and Doncaster, said they wanted to pursue the pan-Yorkshire deal. On Friday, Mr Javid issued a letter to the leaders of all councils in Yorkshire, saying: "We are not at this point prepared to consider any other deal proposal which would cut across or unravel that Sheffield City Region deal. "Parliament, with the consent of the four councils, has already legislated to implement key elements of the Sheffield City Region deal, in particular for a mayoral election in May 2018. "Government has no intention of seeking any further legislation to undo what has already been enacted on the deal." Following the meeting, a Department for Communities and Local Government spokesman reiterated Mr Javid's comments, adding that it was "very disappointing that South Yorkshire councils have pulled away from their devolution deal".